The organization hierarchy mentioned below will not be the same in all companies and differ from each other. We have placed only few titles in the chart. 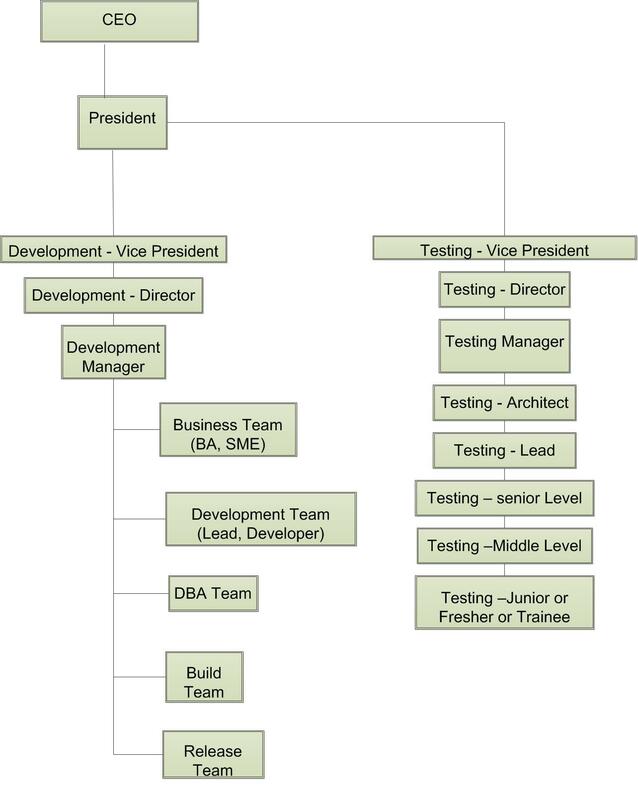 A software tester begins his /her career as a trainee and gets molded as a senior software tester or software testing lead after 4 to 5 years of experience. Playing a lead role involves additional responsibilities like metrics collection, review, training the junior resources etc apart from testing. and involve in project management, quality assurance, process management, SDLC models selection, administration etc. The mapping between career path of a tester and experience in the below mentioned table is based on my experience and it will vary from company to company. The salary range of a software tester working in USA mentioned in the above table is a ball park number. Salary will be different from company to company and will be based on US TAX TERMS like w2 (with benefits and without benefits), h1b processing fee, green card processing fee, health insurance, vacation, duration of the project, role in the project, location, sign on bonus, relocation expenses, bench period etc agreed by the candidate and the employer. When a candidate works on billing rate per hour with an employer, then the amount that is earned will be more since the employer will the pay only the billing rate agreed and will not care about the benefits of the candidate. A middle level software tester can get $40 to $60 per hour and a senior level tester/lead can get between $50 and $70 etc.